Patrick Meier and some of the rest of the team behind the amazing Haiti earthquake crisis mapping effort have set up a Libya Crisis Map which plots tweets and many of other kinds of on-the-ground reports on a map of the country. The reports come from citizens and journalists and aid agencies and anyone else, and each is tagged as “verified” or “unverified.” Sensitive information, which might be used to retaliate against sources or others, is redacted. The second reason why this is no Haiti is because the request for activation of the Standby Task Force to provide live crisis mapping support came directly from the UN OCHA’s Information Management unit in Geneva. This was not the case in Haiti since there was no precedent for the crisis mapping efforts we launched at the time. We did not have buy in from the humanitarian community and the latter was reluctant to draw on anything other than official sources of information. Crowdsourcing and social media were unchartered territories. OCHA also reached out to CrisisCommons and OpenStreetMap and we are all working together more closely than ever before. 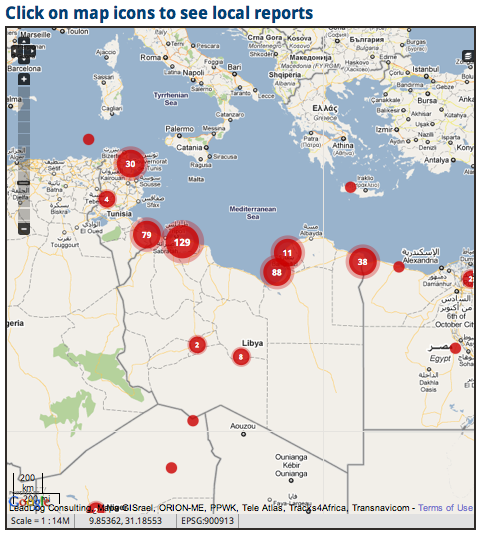 Contrast this to the case of Libya this week which saw an established humanitarian organization specifically request a volunteer technical community for a live map of reports generated from Twitter, Facebook, Flickr, YouTube and mainstream media sources. Seriously, I have never been more impressed by the humanitarian community than I am today. The pro-active approach they have taken and their constructive engagement is absolutely remarkable. This is truly spectacular and the group deserve very high praise. Definitely worth taking a look at the map. More on the process at UN Global Pulse.